Timely - as the June 27 flow continues to move toward Pahoa! 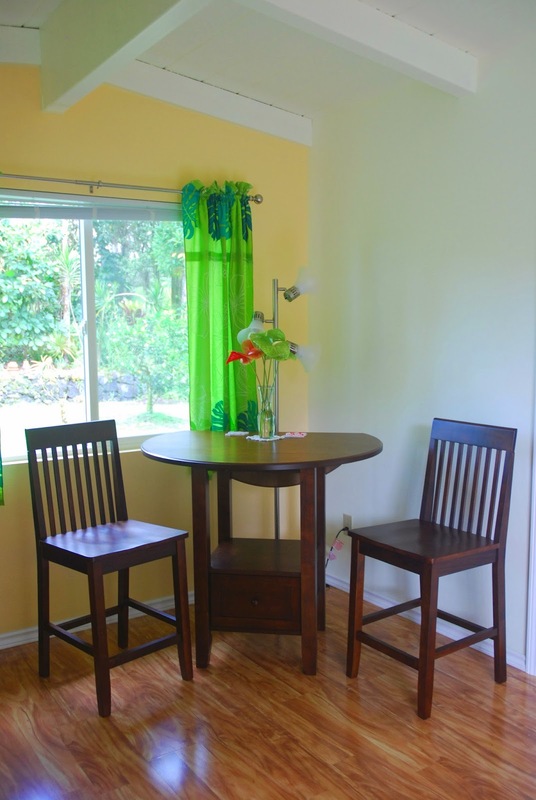 Stay at Hale Moana Bed & Breakfast and experience old and new flows in the Puna Area. 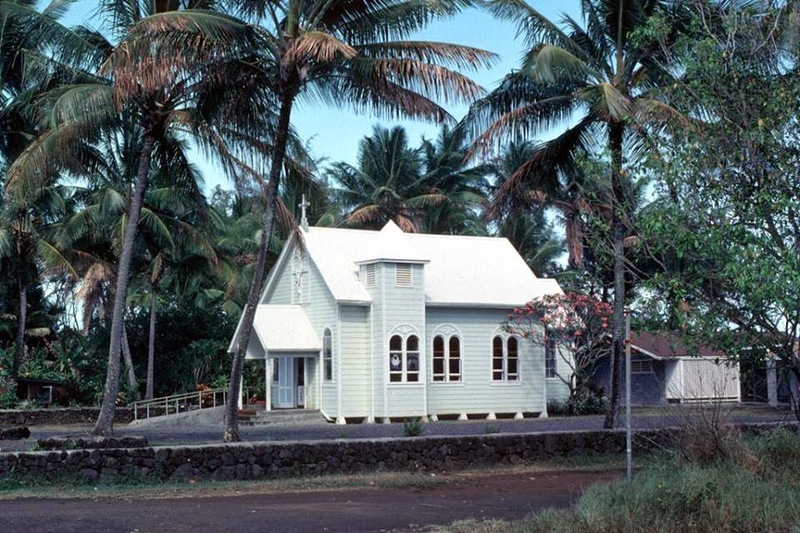 Visit the little town of Pahoa! Reminiscing with Mayor Billy Kenoi about his childhood home before Pele reclaimed it. published in Ke Ola Magazine Mar-Apr 2014 issue. Kalapana. Synonymous with the destructive power of Madame Pele. Little signs remain of the community that was destroyed by lava flows from Kupa'ianaha vent between 1986 and 1990. Those borne in the remote fishing village of Kalapana are proud to call the place home. They remember well a tight-knit community surrounded by beautiful Kaimu black sand beach and Queen's Bath. Just ask Billy Punapaiaalaikahala Kenoi. 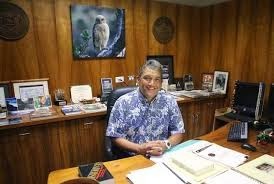 The two-term Mayor of Hawai'i County has fond memories of the place he grew up and the way things used to be before the town was overrun by lava in 1990. "It' one of those places where when you're a small kid, you think you're poor, but when you're an adult and you look back, you realize you were one of the luckiest kids in the whole world." Billy was born right across from Kaimu in November 1968. His mother had moved to Hawai'i with Billy's oldest brother and two sisters after the death of her first husband. She subsequently met and married Billy's father, giving birth to Billy and three more daughters. "Then we wound up hanai'ing (Hawaiian form of adoption) my oldest brother's friend. So there were eight [kids] in our house." Life was simple for the large family, lacking electricity and other modern conveniences some take for granted today. "We had kerosene lamps," says Billy. He continues, "There was no running water so we had outhouses. We took a shower at either Harry K. Brown Park or would bathe at the Queen's Bath." A collapsed lava tube filled with freshwater from nearby natural springs, the Queen's Bath was used only by ali'i (royalty) to bathe in and relax in ancient times. "When we were young, that was a community bathing place. All the families would gather in the evening and sit and talk story. The Keli'iho'omalus, the Ka'awaloas, Hauanios. The families would take turns walking down, bathing as a family and walking back up. A lot of families were 'ohana." Indeed, Billy is related to another well-known Kalapana family, the Keli'iho'omalus. (See Sep-Oct 2012 issue of Ke Ola for "Talking Story with Uncle Robert"). "My Dad and Uncle Robert Keli'iho'omalu are first cousins," explains billy. "The best part of growing up was it was all about family. Everybody was a cousin. Every adult was an aunty or an uncle. Had a lot of love a lot of respect. Not plenty money, but nobody cared about that. Always seemed like we had food on the table." Billy may not have minded the lack of material wealth when he was younger, however there was one thing that he was ashamed of: his middle name. 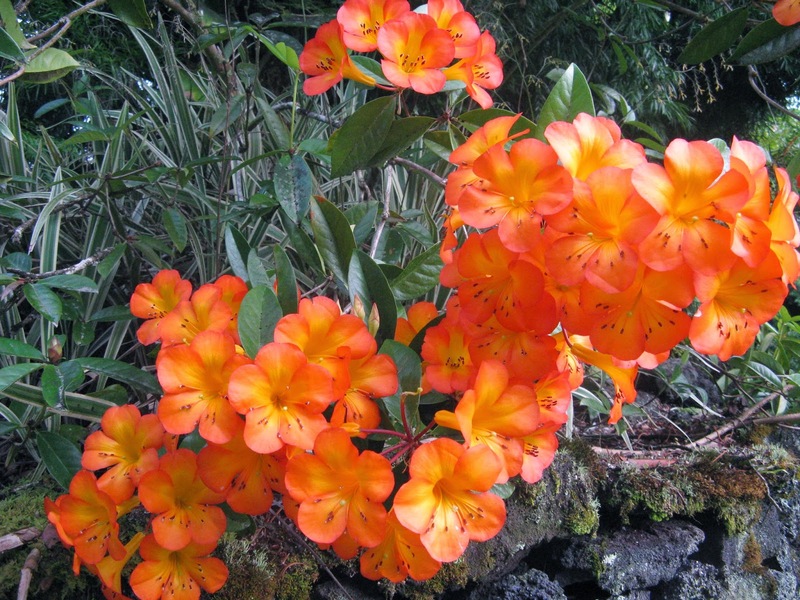 Billy's middle name is Punapaialaikahala, which translates to "the fragrance of the hala that was associated with Kalapana." 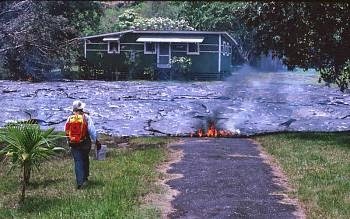 He explains, "In Kalapana the lauhala mats were unlike anywhere else. They would go up along the walls. It was very unique. In most places the lauhala mats would extend to the wall itself, but in Kalalpana the mats would go up the walls about 6-9 inches. In the space in between the lauhala mats and the wall people would sprinkle the fruit of the hala tree. 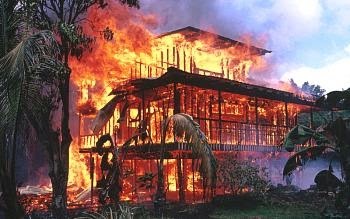 So people would walk into a house in Kalapana and it would have a certain fragrance. And that fragrance is Punapaiaalaikahala. "But that's not the kind of stuff that's cool when you're growing up," he says with a laugh. "you'd rather have a middle name like Ikalani 'the warrior from the heavens.' You don't want to smell like a tree." billy points out that he is now proud of his middle name and has given each of his three children middle names that reflect Kalapana. Son Justin's middle name is Kalapana, Liam's middle name is Pilipo, and his daughter's middle name is Mahinalani, which refers to the full moon that rises over the ocean in Kalapana. Billy's family moved to the Waiakea area of Hilo when he was in kindergarten and the family frequently visited their Kalapana home. They would use it as a beach house, spending weekends and holidays in Kalapana. After graduating from Waiakea High in 1986, Billy returned to Kalapana where he worked building stone walls and started his own landscaping company. "We never had a bus system, but if any aunty or uncle passed by (in their car) they would pick you up," says Billy. 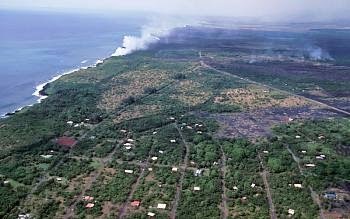 In 1986 Madame Pele started reclaiming Kalapana. Kilauea Volcano had begun erupting in 1983. In July 1986, lava erupted from the Kupa'ianaha vent and began its slow voyage to the sea. By November of that year, the lava had reached the ocean and 17 homes had been destroyed, including eight homes of Kapa'ahu (a town west of Kalapana) overrun by lava over the Thanksgiving holiday. The worst seemed to be over. It wasn't. In 1990, eruptions from the vent continued with sporadic pauses. 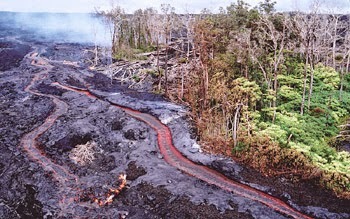 After each pause, lava would overrun the previously created lava tube and form new tubes, pushing the lava further downhill toward the oceanside community. "You know, it was going since 1983. By l990, I kept thinking Madame Pele was not gonna take Kaimu, not gonna take the bay, not gonna take Left Point," said billy. 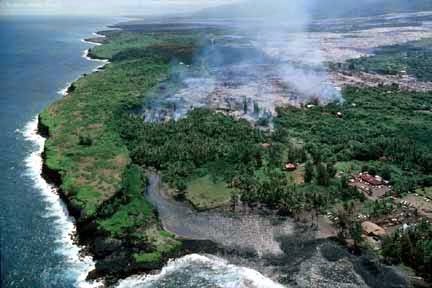 By the end of February 1990 lava had entered the ocean just west of Kalapana. That didn't stop Billy and his friends from surfing, though. "We'd walk around the road blocks, shaka Harry Kim, and go surf. The respected that it was our home. (At the time Harry Kim was head of Hawai'i County Civil Defense. He would go on to serve as Hawai'i County Mayor from 2000-2008 and asked Billy to serve as his executive assistant from 2001-2007. Kanoi succeeded Kim as Mayor in 2008). 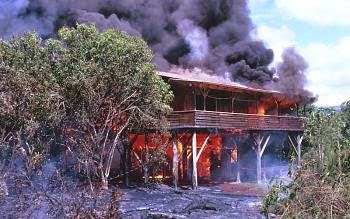 As spring turned into summer in 1990, the lava continued its relentless onslaught into the Kalapana community. "I didn't think [the lava] was going to take Walter's [Kalapana Store and Drive Inn] even when the [Star of the Sea Painted] Church had to move. Never thought the church was gonna have to move. "You know that was a devastating day. That was a very divisive issue in the community - on whether or not to actually move the church. Half the community said 'leave 'um' and half the community said 'move 'um'. That was a difficult decision," Billy says. 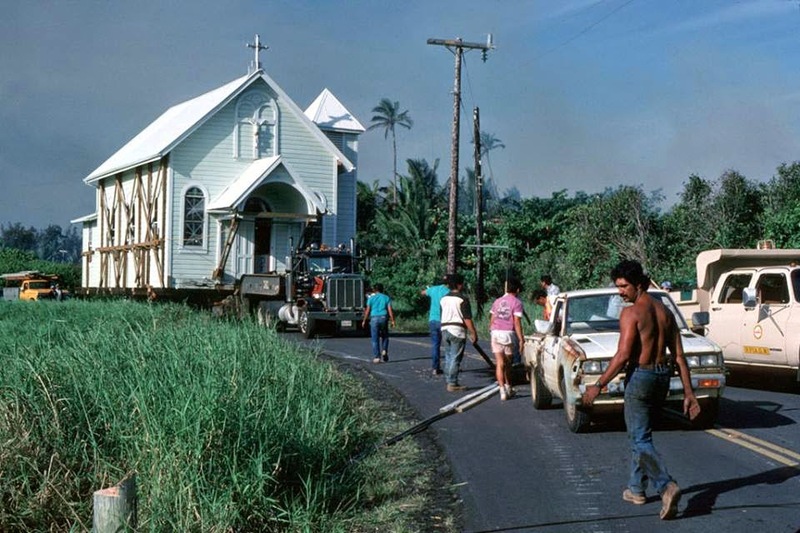 With massive community effort, the church was loaded onto a flatbed tractor-trailer and moved out of harm's way just an hour before lava overran where it stood. Now decommissioned and on the National Register of Historic Places, the Star of the Sea Painted Church can be found on Highway 130 between mile marker 19 and 20. It's open to the public seven days a week free of charge between 9am-4pm. And while his beloved community was going through tremendous upheaval and devastation, Billy's life was also about to change. After taking classes at Hawaii Community College and HU Hilo, he had been accepted into the National Student Exchange Program to attend University of Massachusetts at Amherst. Billy kept surfing in Kalapana up until the day he left for the mainland. "I was in the water paddling toward Drain Pipes. The lava was in the bay and was hitting Drain Pipes already - you could smell the sulfur. I surfed Kalapana to the very last day I left in August 1990. When I left in August 1990 to go to UMass, Kaimu was still thee. In October 1990, I got the phone call - Kaimu, gone. Left Point, gone." By the end of 1990, Madame Pele's onslaught into the community had claimed more than 1`80 homes, parks, businesses, roads, historical sites, and beaches, burying them all under nearly 50 feet of lava. Billy said pain from the destruction of his birthplace was so intense it took him years before he could bring himself to go back to the community. "It took me three years to go down and look at it. 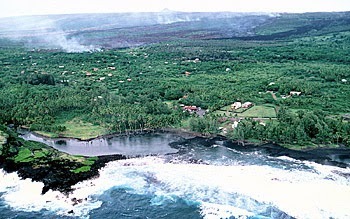 If I had a function to go to in Kalapana at Uncle Robert's house, I would go at night, so I didn't have to see te lava. "Finally after three years I went back. It was devastating. It let you know that nothing is permanent. I never took a picture of myself at Kaimu because I thought Kaimu would always be there. I think back now and think I should have taken pictures. "Now, from where you used to put your foot in the water you have to walk 20 minutes to get to the ocean." And yet, when Billy speaks of Kalapana, it is not of regret for what was lost, it is of gratitude. "For all the tragedy of the taking of the area, I still to this day think how blessed we were to grow up in Kalapana. My sister and I look back and we laugh. Looking back [we had] no stuff that other kids had, but now we look back and think if we had to do it all over again we'd do exactly the way it was growing up." For billy, Kalapana is a place of solace, not destruction. "It's my home, where I was born and raised. And will finally rest. I feel at peace when I go down there. It's where my parents rest. It's where my children are named after. "I'm very humbled and appreciative to know the families that call Kalapana home. They're all very honorable, humble people. I feel privileged to be related to such talented Hawaiian families. Every family that calls Kalapana home is a special family." Kalapana means to Billy, "The laughter, the love, the family, the music, the ocean. The smell of Kalapana, just driving down the hill. It's still the most special healing place in the whole world." billy also credits his hometown with helping him achieve his goals. While attending UMass, he was selected to intern with the late Senator Daniel Inouye. He went on to receive a law degree from UH William S. Richardson School of Law where he was the class commencement speaker. And in 2008, at age 39, he was the youngest elected Mayor in Hawai'i County history. "When you're from Kalapana and you don't know nothing, you're fearless," says Billy. "What happens if you don't make it" Nothing. Then I get to go home and surf in the most beautiful place in the world." Many of you may have heard the news: Madame Pele is on the move again! 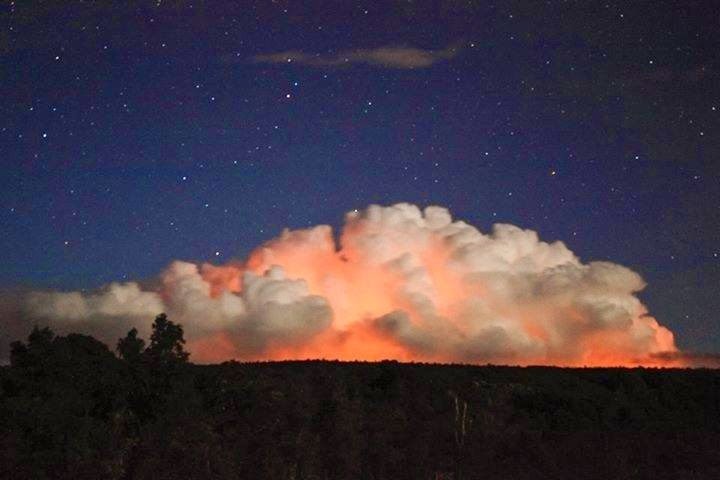 The latest lava flow from Kilauea is heading toward our little town of Pahoa! The community is preparing for the impact of the lava and County, State and Federal partners are working on providing necessary access, in the event that Highway 130 - going passed Pahoa - will be cut off by the flow. Hale Moana Bed & Breakfast is about 7 miles from where the flow is expected to come through. We will be open and will continue to welcome visitors from around the world. The area here is safe and no impact from the lava is to be expected. We are also at a location, where possible smoke or emissions will not affect us, because of the prevailing trade winds usually blowing from the south-east. Should the lava cross Hwy. 130 access to the B&B may change. If or when this happens I will let you know. Currently, the flow can only be seen from the air. There is no public access to an official viewing area at this time. This may change as conditions become clearer. Please, let me know, if you have any questions or concerns regarding the lava situation. This year Hale Moana Bed & Breakfast was once again awarded the Certificate of Excellence for 2014 by Tripadvisor and it is one of the leading B&Bs for the Pahoa area. Thank you very much, for the great feedback on Tripadvisor and Google that many of you have given us. It is such a helpful resource for many travelers and we truly appreciate your time and effort in sharing your experiences. 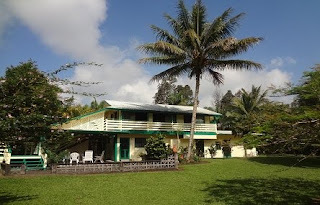 For those of you, who have not been here: Hale Moana Bed and Breakfast is conveniently located between the Hawaii Volcanoes National Park and Hilo, in the tropical area of Puna on the Big Island of Hawaii. Hale Moana is a licensed, quality inspected Hawaii B&B surrounded by two acres of beautiful botanical gardens in an ambiance of old Hawaii. Hale Moana Bed & Breakfast now offers three suites with living room and kitchenette and one studio. All have private bathrooms and separate entrances. Your comfort and enjoyment during your stay is of utmost importance to us. I strive to make your family vacation or romantic getaway as memorable and relaxing as possible. The details and the privacy of our suites reflect the sense of caring and Aloha that we extend to our guests. We welcome families with children and are fully set up to accommodate them. Free Wi-Fi, laundry facilities, a BBQ grill, snorkels & masks, maps, and a shelf full of local resource information is available to our guests.